This is a sponsored post written by me on behalf of Raise for IZEA. All opinions are 100% mine. I am really getting into using my slow cooker! Because it’s just the two of us, I don’t bring them out too often because the size of slow cookers I own are too large for two servings. Therefore, I often wait to use them until we have a party. 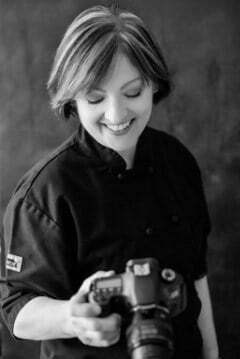 However, that’s all changing the more I use my slow cookers–the ease and convenience can’t be beat! First though, I want to tell you about something else that’s easy and convenient! The Raise gift card marketplace! 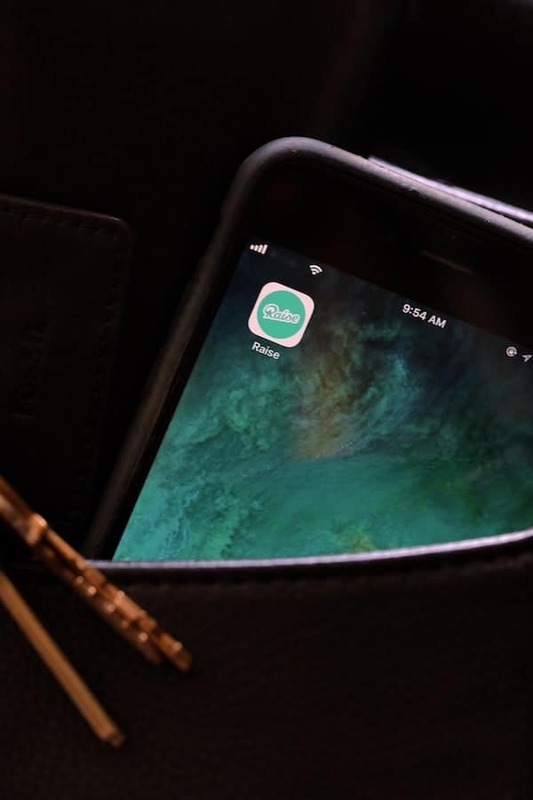 No doubt you’ve heard of Uber, Lyft and AirBnB. Raise is another innovation in the new “sharing economy.” Super-simple to use, Raise is a free iOS and Android app that connects buyers and sellers. We always think of gift cards as well, gifts for other people. Not with Raise! Your money can go a little farther by using discounted gift cards to make purchases for yourself! Yes! Splurge a little on yourself without guilt! Or, save on all your holiday shopping, grocery and entertaining needs. No sale? No problem! With a Raise gift card, you create your own sale wherever you shop because there are thousands of brands available for purchase. You can take your savings with you wherever you shop. Raise stores your gift cards in a “wallet” for use whenever you need them. You can also buy with confidence because Raise has a 1-Year Money-Back Guarantee! Download the free Raise iOS or Android app. Select where to save and download the gift card. To make it even easier to start saving, use promo code COOK10 to receive $10 off a gift card order of $50 or more as a new Raise user. Now onto this hot, spicy, hearty and delicious slow cooker Cajun soup! I don’t find myself with a bag of 15-bean mix in my pantry very often. Especially one where I had no idea where it came from! Actually, I think my mother-in-law was the culprit during her Easter visit, possibly intending to make soup with the bone from our Easter ham. Because we’re talking about saving money, every so often I go through our pantry and look for things that don’t get used in our normal meal rotation like rice or canned tomatoes do. Some things tend to get overlooked or pushed back and by the time you get to them, they’re out-of-date and have to be thrown out. 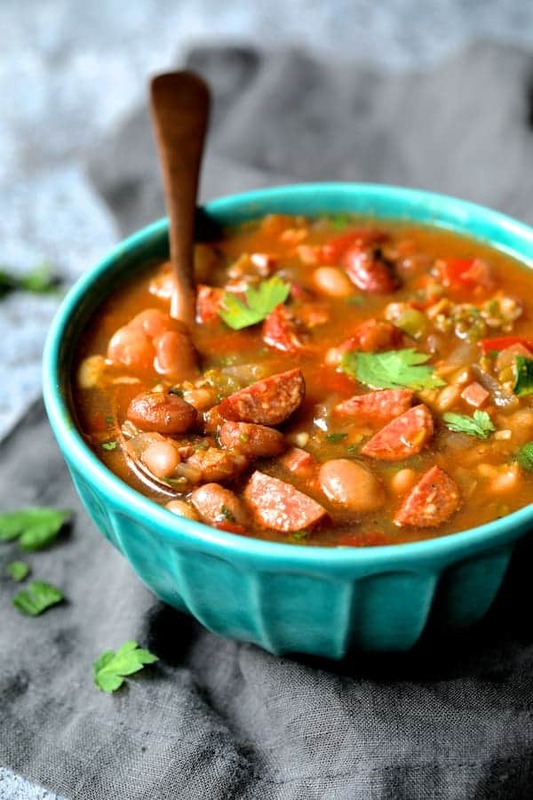 I found the bag of 15-bean mix and this Slow Cooker Cajun 15-Bean Soup with Andouille, Ham and Bacon was born! When cooking with dried beans, you have to be careful so they don’t come into contact with salt or acid. They will not soften up and hard beans are simply awful! If you have the time, soak the beans in cold water overnight in the refrigerator. If you’re like me and sometimes poor at planning, you can do a “quick soak.” Simply bring a small pot of water to a boil, add the beans, turn off the heat, cover and let stand for an hour. Drain and you’re ready to roll! Because I don’t want salt or acid to come in contact with the beans, I use water or an unsalted chicken broth and add roasted chicken base later for flavor and depth. Likewise, I add the Cajun seasoning (most blends contain salt), tomatoes and meats (because they’re salty, too) after the beans have softened up. There’s still plenty of time for the flavor to develop. And, if you make this a day ahead of time, the flavor will develop from sitting. If you don’t have a slow cooker, I’m sure you can get one with a gift card for yourself from the Raise app! 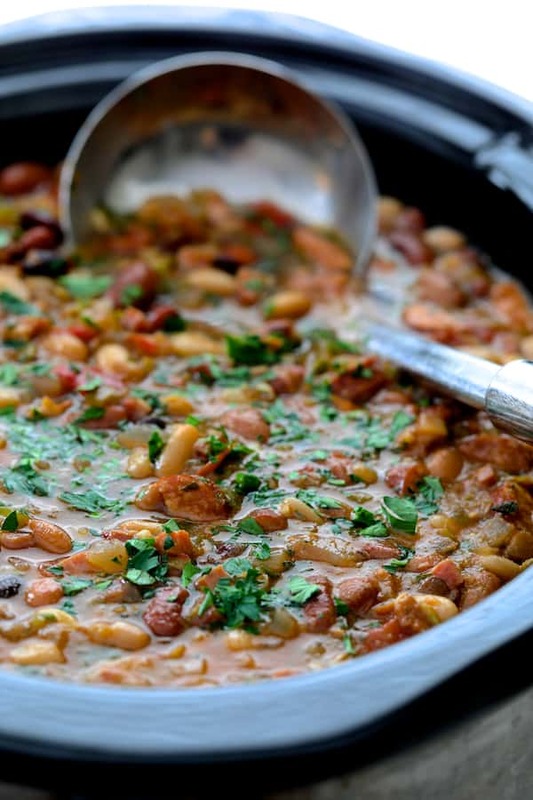 Get the ingredients for this Slow Cooker Cajun 15-Bean Soup with a gift card from the app, too! Or, get this soup going in your slow cooker, purchase the gift cards you need, go shopping and come home to this easy, hearty and delicious soup. Remember that promo code! COOK10 for $10 off an order of $50 or more! Approximately 1 hour before starting the slow cooker, bring a saucepan full of water (large enough to hold all the beans when they expand) to a boil. Add the beans, turn off the heat, cover and let stand for 1 hour. Drain. Combine beans, onion, green bell pepper, celery, garlic, water (or unsalted chicken broth) and bay leaves in a slow cooker. Cook 4 hours on high or 7-8 hours on low. When the beans have approximately 1 hour to go on high or 2 hours to go on low, add Cajun seasoning, tomatoes, tomato paste, roasted chicken base, sausage, ham and bacon. Cover and complete slow cooker cycle. Remove and discard bay leaf. Add parsley, cayenne and salt and black pepper to taste and serve. Omg! Um, trying this. Looks delicious. Thanks, Alexis! Hope you enjoy! I have cooked dry beans my entire life and I use salt never had an issue in 45 yrs — 3 generations before me have also used salt no problem. I’ve had the problem in the past myself, even using an electric pressure cooker to try and get them softened. They were not old beans. I would much rather post a recipe that everyone can have success with than tell my readers to add salt or acid and have them waste a lot of ingredients like the andouille, ham and bacon. So, definitely keep doing what you’re doing if it works! Thank you for your comment. This would be perfect for a chilly day dinner! Beans are one of those things I can make and the whole family likes! This looks and sounds so AMAZING! I’m printing this one out now so I can make this for this winter! YUM YUM YUM!! I never knew the importance of avoiding any contact with salt when cooking with dried beans – so glad to know for the future! I completely hear you about needing to go through the pantry every so often to find those “hidden gems.” We are going to be moving next year and I’m already thinking I need to start really making an effort to use what we have tucked away! Thanks, Monica! …Also avoid anything acidic. Going through your pantry simply is important from a not-wasting-food standpoint. Too many people have too little. If nothing else, donate it. Hi, Elena, Yes, I didn’t use my slow cooker nearly enough. Now I’m getting addicted to it! 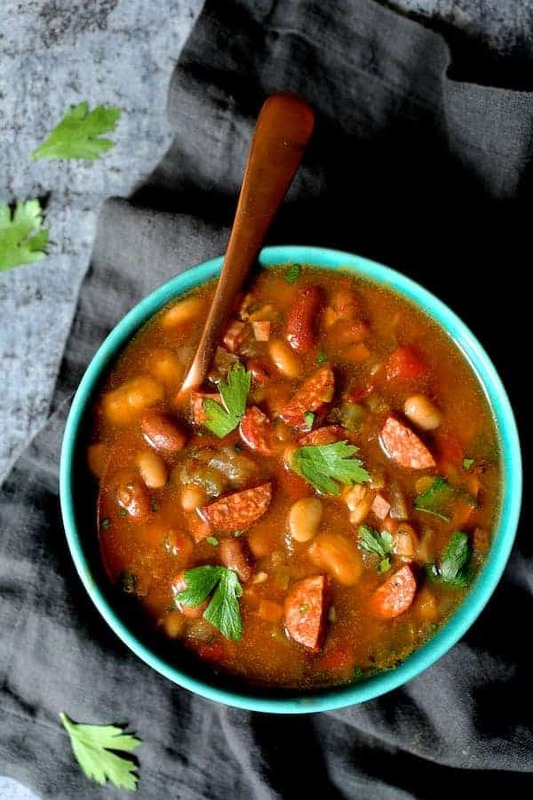 Normally I get a bit skeptical of bean soups because sometimes they look so much better than they taste but when I saw yours included ham, bacon and sausage (the trinity of flavor), I was convinced! Lovely pictures too! What a perfect winter soup! Soul warming soup as my family would say. Pinned! This looks like a wonderful winter soup! Comfort food in a bowl!! This looks so comforting! Beans and meat all-together in a bowl! Yumm! Your bean soup by the way makes me want to dig in instantly! I wish I could get Andouille sausages here! For now I will need to make your soup without the sausage. This looks like total comfort food. 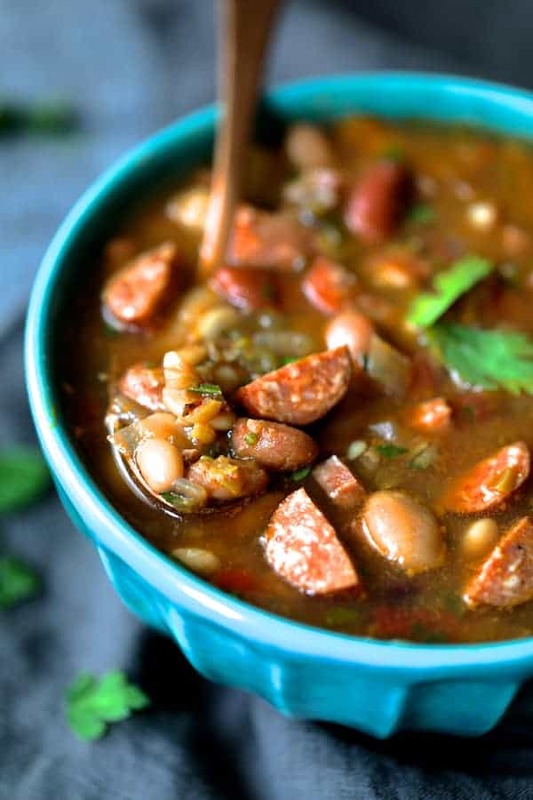 I love making mixed beans and this one with Cajun seasoning and sausages might just be perfect for our weeknight meals. Saving for later. Yum! Thanks, Veena! You’re right, it is total comfort food! Hope you enjoy! This looks like such a tasty hearty soup! It has all of my favorite things in one spot and I can’t wait to try it! Thanks, Dominique! Hope you enjoy!